This simple homemade apple pie filling will warm your body and heart. I have seen jars of apple pie filling sold at specialty stores and I always thought that was a great idea. You can use it to pair with ice cream, on pancakes, or on its own for a treat. The best part of apple pie filling is that you are skipping the crust (which is sad for many). Why is this great? Pie crust is made with a ton of butter (or lard) and flour and adds a bunch of calories to pie. I have never figured out how to make a crust that was low in calories. This way, you can enjoy apple pie without going over your calorie budget. Some other ideas I have had include my healthy apple crisp and my apple chip recipe. I made this in a slow cooker because I love the convenience of being able to walk away for hours and not think about what I am cooking. I used a slow cooker liner to ease clean up so this whole project was a snap. The house smelled so good when this was cooking. It is amazing to me how cooking apples smells like home. Perhaps it is because I live in New England. If you live in Santa Fe, does the fragrance of roasted chilis smell like home? I would love to hear what cooking smells make people calmer and more comfortable. All you do is peel, core, and cut up the apples – mix in the topping – and cook for a couple of hours. It’s really simple and it makes it easy to cut down on sugar. I cut the sugar in half from another recipe I found and I thought this was plenty sweet. There is only 8 grams of added sugar in a serving (about 1 ½ teaspoons). Most of the sugar is from the apples. I store this in the fridge in a tightly sealed container and heat up a little bit when I want a dessert. What would you do with this apple pie filling? Line a 6 quart slow cooker with a slow cooker liner or spray it with non-stick spray. 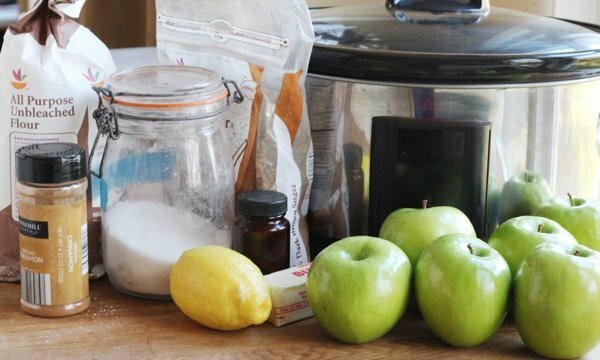 Put apples in slow cooker and mix with lemon juice. Mix sugar, brown sugar, flour, cinnamon, and nutmeg in a small bowl. 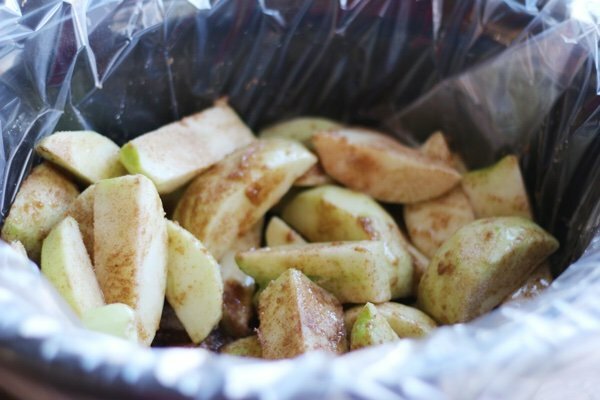 Add sugar mixture to apples and toss until all the apples are coated. Drizzle with butter and cook for 2 hours on high or 3 hours on low. Serve immediately with ice cream or refrigerate and save for later in a tightly sealed container. This is great with whipped cream or on its own. can this be made without a slow cooker as i don't have one and would like to make this recipe. 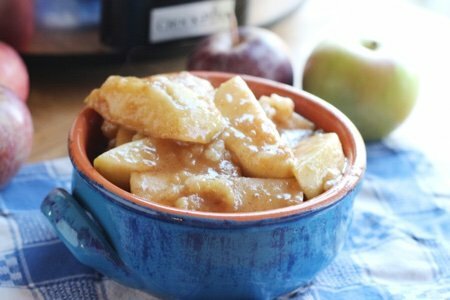 Can you use regular applies instead of granny smith (like gala)? 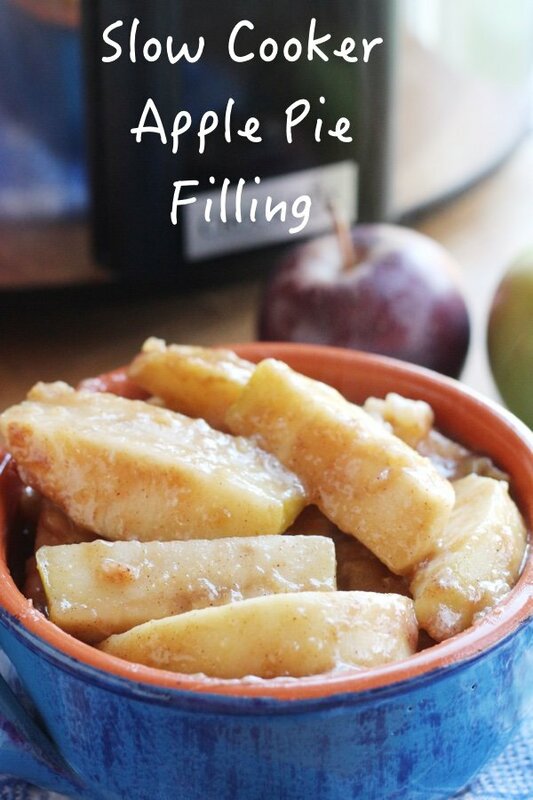 I'm going to can this apple pie filling recipe in pints. Can't wait to see it up on the shelf during the winter for whenever I want a sweet treat. I think it will make nice Christmas gifts too. Can the peel remain? I typically keep the peel in most apple recipes for its added fiber and nutrients. @Judith - yes! cook it on the stove in a heavy saucepan at a low temperature or toss it into a casserole and bake it at 350F for 20-30 min. @Marilyn - you can use any apple you want. Granny Smith holds it shape but another type of apple means you could use less sugar. I would cut back on the cooking time with Gala and add only 3 tablespoons of each sugar. @Maggi - if you don't mind the peel -leave it. I like the texture without them so I peel them but it won't matter in the recipe. Have you tried phyllo dough crust? I use it for chicken pot pie and it is delicious! I don't brush the layers with butter I just use a few on the bottom and a few strips on top. Brush with egg white if you want it shiney. I made some applesauce this way to replace the oil in recipes. But lately I just cute an apple up put it in a microwave bowl....sprinkle with raw sugar a little cinnamon, microwave for one minute..let cool a few minutes put a scoop of frozen yogurt....mmmm... it delicious! Hmmm... let me think...I'd try it on top of Greek yogurt perhaps with some vanilla and a teeny bit of maple syrup added to yogurt..making it taste ice creamish. Ooh, this looks yummy! I could top it with a little bit of granola just to give it some crunch. :) Also, I see some ALDI cinnamon in your pic - I LOVE that store! I made this yesterday to bring to my monthly potluck meal and Scrabble game. I don't have a slow cooker so used my cast iron enamel dutch oven. 325 degrees, 1 hour covered, 45 minutes uncovered (it was a little too juicy). Only stirred a couple of times so apples would not break up. Served with a couple of fancy cookies, and a small dollop of Greek yogurt. It was awesome, and much easier than pie. I found a similar recipe on another site; almost exactly the same except that it called for a half cup of sugar. Can you imagine? 3T of maple syrup is plenty.